Here is a unique Aikido download that can help you increase your skills. This Gold-Mine of wisdom can vastly improve your abilities... Fast! Action is the Key to Your Success. Beginners, regular students, and even seasoned instructors, can step on the fast-track to Aikido mastery. Here is a wealth of information, right at your fingertips, all condensed down to the simple and practical truths. Learn how to avoid many of the training pitfalls that can completely block your path, and discover a key to unlock your true potential. 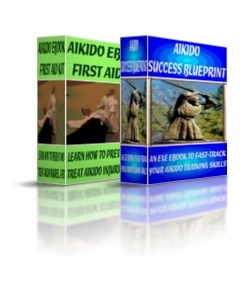 Can you save time if you buy the Aikido Success Blueprint? Of course you can, if you follow the Action Guide! Plus Free Bonus Ebook, Videos + Audio! How To Successfully Choose Your Aikido Instructor. Learn How to Prevent Injury with Aikido Ukemi & Breakfalls. Discover Simple Ways to Improve Your Techniques... Fast! Learn Aiki Principles... the Real Key to Effective Technique! And Much More... You Don't Want to Miss This! The Aikido Success Blueprint gives You the essential tools you need to truly excel and reach your goals. The key to fast learning lies within you, and you have the power to unlock the door to an exciting new world. This collection can certainly help you train smart. Whether you are an absolute beginner, a seasoned student or even an Aikido instructor, its all here, every detail, all in one place, to get you to your peak level of skill. Plus you'll get AMAZING FREE BONUSES including a1 hour unique Video!